Smooth and smart, with a soft spot for the environment. On May 30, the cartridge remanufacturing industry scored a massive victory that will resonate in this industry and beyond in the U.S. Supreme Court case of Impression Products v. Lexmark International. The case was a success, at its core, because of attorney Ed O’Connor. Twenty years ago, Lexmark International announced smugly to the cartridge remanufacturing industry that it was going to sell its latest cartridges with the restriction that they couldn’t be remanufactured or recycled, because of the patent rights that Lexmark was retaining. That sent the cartridge remanufacturing industry into a tailspin, igniting a fire under its supporters. One such supporter was attorney Ed O’Connor, whose distinguished pedigree included representing aftermarket members such as Repeat-O-Type and Independent Ink. The industry went to war with Lexmark to end its misuse of its patent rights. There were skirmishes with battles won and lost, but Lexmark’s restrictive actions continued. Thirteen years later, Lexmark upped the ante by suing companies that were remanufacturing their “restricted” cartridges using cores first sold in Canada. Impression Products was one such defendant. Its owner, Eric Smith, outraged by Lexmark’s actions and unwilling to just submit, contacted O’Connor to fight it. That’s when Lexmark’s winning days were numbered. It counted on its status as a multi-billion-dollar company to continue to bully the industry and roll over its small competitors. It didn’t count on Ed O’Connor. The “awful” cases were being used by Lexmark to support their claims that their return/prebate program was legitimate. Mallinckrodt case validated single-use licenses on medical equipment. Jazz Photo raised the question of whether an overseas sale extinguished U.S. patent rights. It was the latter case that led Lexmark to sue Impression Products and dozens others over cores first sold in Canada. The financial demands of the litigation clearly favored Lexmark. Still, several defending remanufacturers fought back, at least initially. However, it was clear that these issues would not be resolved in a single trip to the courthouse. It would have to go all the way to the U.S. Supreme Court. Many in the intellectual property legal community saw the Kirtsaeng decision as the “first shoe” to drop on international exhaustion, a relatively untried area of the law. The other shoe would drop when the legal system was presented with a case involving patent rights and overseas sales. A case that included the exact facts and legal issues as those created by Lexmark. ‍In some instances, inexperienced attorneys take cases pro bono to gain expertise. And even experienced attorneys will take a high-profile case pro bono for the exposure. O’Connor needed to do neither. as patent and antitrust jury and appellate lawyer for Poms, Smith, Lande & Rose, one of the oldest patent law firms in Los Angeles. O’Connor has previously appeared before the U.S. Supreme Court. His first case was Illinois Tool Works v. Independent Ink, (2006). O’Connor represented the aftermarket player against the major international conglomerate. This patent and antitrust case was one of many building blocks that helped the aftermarket in the Impression Products case. e also represented Repeat-O-Type in Hewlett-Packard Co. v. Repeat-O-Type Stencil Mfg. Corp, Inc., which was tried before the Federal Circuit Court of Appeals in 1997. He obtained a summary judgment against Hewlett-Packard of non-infringement based upon a finding of successful permissible repair/reconstruction. The case is one of the leading cases of the repair/reconstruction doctrine.Ed is an internationally-recognized expert on intellectual property law. 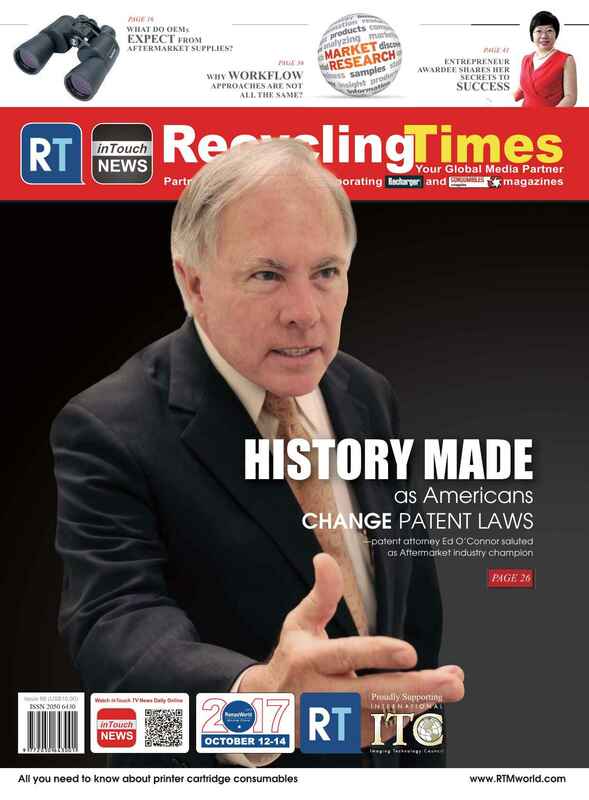 He is listed in the Los Angeles Times as one of the leading lawyers in Southern California and was listed in the San Diego Register as the only leading lawyer in both patent prosecution and intellectual property litigation. In addition to representing clients in the United States Supreme Court, Ed has represented clients before the International Trade Commission and has won patent infringement, antitrust, and other intellectual property cases throughout the United States. Among the clients he has represented in litigation are Kawasaki (antitrust, defense); Nike (patent, defense); and Thermos (trade dress, defense). If you are not impressed yet, O’Connor is also fluent in Spanish. He has written three books on Intellectual Property Law and Litigation, published by the American Bar Association. ‍O’Connor was already well-known and highly-respected when Lexmark launched its nefarious return program and he was outspoken in his disdain for it. He leveled the playing field in a huge way when he took on the Impression Products case pro bono. That incredibly generous act was a massive game changer. And by using clever trial procedure, O’Connor was able to shorten the time it takes to transverse the playing field. “One of the biggest problems with our court system is that it takes so long to get a case resolved. I decided to use the technique of fling a motion to dismiss (the lawsuit), which is an issue of law only, as a way of shortcutting the case,” O’Connor said. “By using that technique, I was able to avoid a trial and the attendant delay. In addition, by moving against both Jazz Photo regarding the importation of previously sold cartridges and by moving against Mallinckrodt, regarding restrictive label licenses on products (Lexmark’s return/prebate program), I created additional pressure on Lexmark. “The trial court denied my motion to dismiss regarding the international sales issues in the case, but granted the portion regarding Lexmark’s prebate program,” O’Connor said. This put pressure on Lexmark to stipulate to the entry of final judgment on both those issues, without the necessity of a trial. Therefore, we were able to move this case to the Court of Appeals for the Federal Circuit almost immediately. The road to victory was still uphill, despite O’Connor’s cunning manipulation of civil procedure and expertise in advocacy. The wheels of justice turn slowly. The case took seven years to wend its way to the Supreme Court. And Lexmark kept the pressure on in the marketplace and the courts the entire time. But O’Connor never wavered in his support of his client, the industry and his principles. All of that just made the May 30th win all the sweeter for O’Connor. “How would I summarize the victory? First, I consider this a personal victory for me,” O’Connor said. “I spent some ten years attempting to get rid of those cases, and suffered the slings and arrows of those who said I had no chance. Now O’Connor can take this win and go forth to his next cause and challenge. If he chooses, say, world hunger, in about ten years, the world will be well-fed. Sidebar: The Wit & Wisdom of Ed O’Connor.